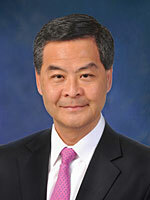 Hong Kong's success as a global trading economy, as an international business and financial centre, reflects both the spirit of the Hong Kong people and the systems and institutions in place to enable their achievements. Among our institutions, the media of Hong Kong have long been a central force, reporting our successes as well as our lesser moments. The media may not always flatter our economy, or our community, but their bright and ever-present spotlight helps ensure Hong Kong's continuing success. With that in mind, I applaud the Hong Kong News Awards 2015 winners – reporters, writers, editors, photographers and designers. In some 16 categories, ranging from "Best Scoop" to "Best News Writing" – in English as well as Chinese – and "Best News Page Design," they have exceeded their profession's demanding standards of excellence. In doing so, they serve as commendable role models for our newspaper industry and champions of the values Hong Kong holds dear to. I am also grateful to the panel of illustrious judges, who have given their time, and expertise, to ensuring that this year's awards meet the highest levels of responsible journalism. My thanks, as well, to The Newspaper Society of Hong Kong for organising the annual Hong Kong News Awards. I wish you all the best of business, and scoops, in the coming year.